Studying important things from the novel is a whole lot more fun with puzzles and games. Built to complement the LitPlans but equally able to stand on their own, our Puzzle Packs give you a wide assortment of extra activities and worksheets to help students remember key characters, ideas, and vocabulary from the novel. Each Puzzle Pack title is filled with extra resources for a single novel or book title. Puzzle Packs are best used as review at the end of the unit of study for the novel. They can be used for whole-class activities with your interactive whiteboard or as individual or group activities with printed copies. Pair students up to work together on some of the activities. They're great for when students finish other class work early. Puzzle Packs help with substitute teacher days or days when you just have 5-10 minutes left-over in the class period. Need an extra section in your unit test? 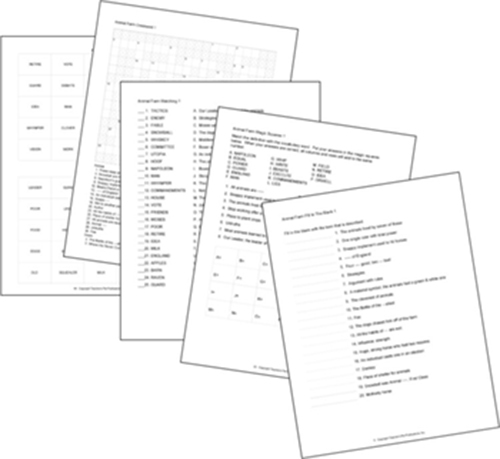 Pull out a worksheet from your Puzzle Pack for an instant test section.